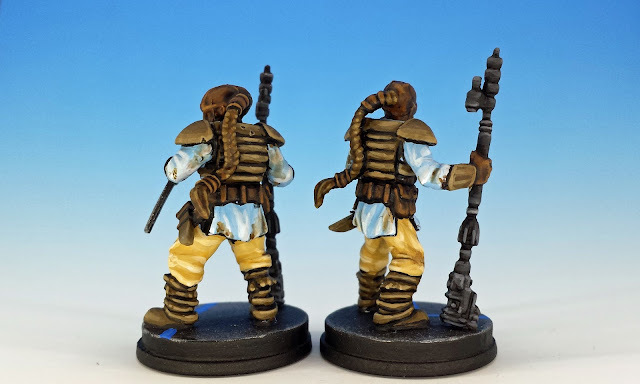 It's took six weeks, but I finally finished painting all the miniatures for Jabba's Realm, the latest expansion for Star Wars Imperial Assault. 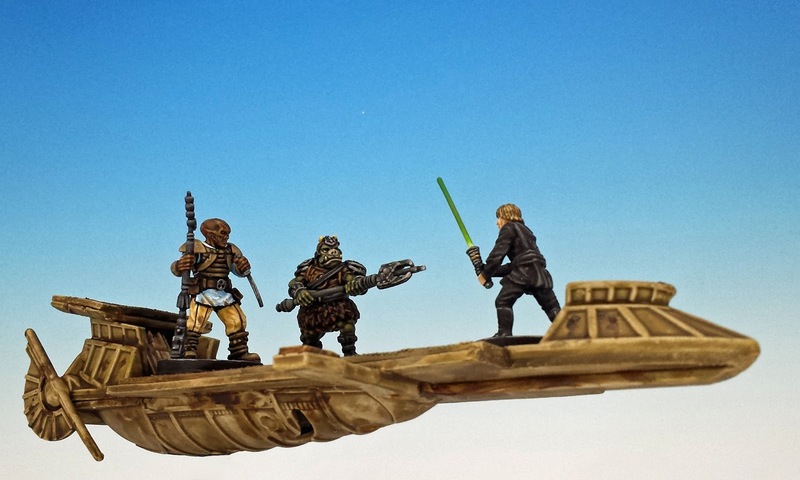 I've already posted pics of the alien heroes from the set, plus the gigantic Rancor. 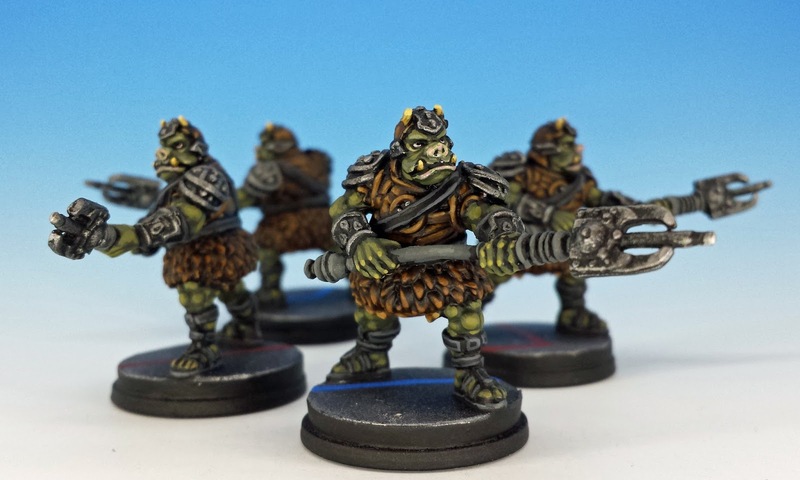 Now it's time to look at some of the rank-and-file miniatures, like the Weequay Pirates, the Gamorrean Guard and the Imperial Jet Troopers. These are the first miniatures that I've painted using reading glasses. Or rather, painting glasses, since my optometrist kindly configured them so that things held very close to my face would be most in focus. I've never had to use reading glasses before, but age has made me dim and decrepit. It's now a race to see how many minis I can pump out before the Grim Reaper finally claims me. Above we see the Weequay Pirates -- made famous for manning the desert skiff used for Luke's execution in Return of the Jedi. The association of the leathery Weequay race with piracy goes back (I believe) to the first season of The Clone Wars (2009), where Count Dooku is captured by just such an outlaw band and observes of them "They are devious and deceitful and most importantly, stupid." In any case, I'm quite pleased with these sculpts. The armour is right out of Return of the Jedi, while their long rifles are a new touch -- they evoke an Afghan Jezail, thus enhancing the sense of primitive desert banditry. But the best innovation is their skull-like face with its H.R. Giger-esque contours -- it makes them even more menacing than they were in the movies. These Gamorrean Guards are completely faithful to the originals from Return of the Jedi, right down to the armour, the skull-cap and the vibro-lance. 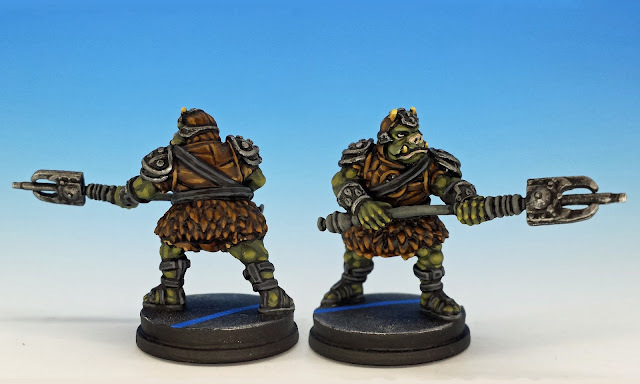 With their porcine snouts and green skin, I've always appreciated the Gamorreans as a direct reference to the pig-faced orcs of early AD&D (and before that, to the "goons" from Sleeping Beauty). And apparently, they taste just like bacon. 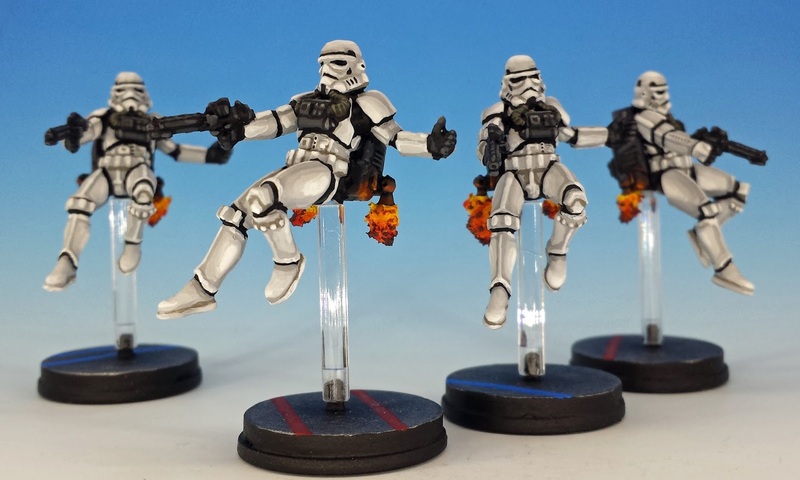 The Jet Troopers were created especially for Imperial Assault, although jet packs (of course) go right back to Return of the Jedi and Boba Fett's unfortunate ignition. These miniatures are well sculpted if somewhat plain, and so I added an extra flare by utilizing foam to sculpt a stream of fiery smoke for each exhaust port. 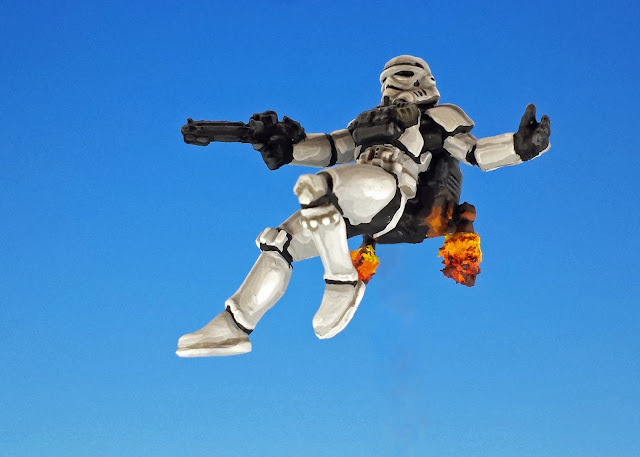 I like the airborne pose, although it makes the trooper seem almost carefree, like the bouncing blonde from Jackie Treehorn's trampoline party. I started wearing "painting glasses" last year... so, from one spectacled guy to another: outstanding work!!!! They all look superb! :D Cheers! It is amazing the difference it makes. I still don't need them for reading, but they certainly help with the painting! Sigh... 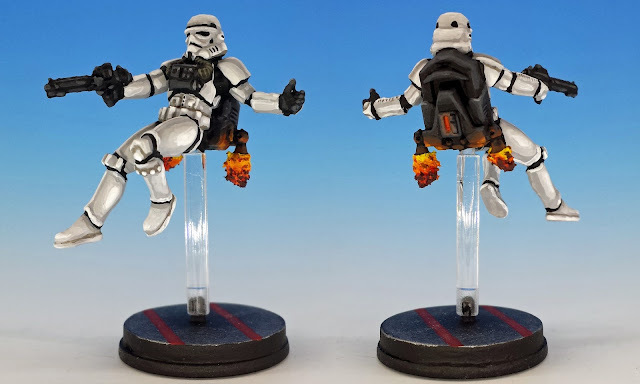 I run out of things to say, because all your posts are fantastic :) Anyway, since I'm in here early I'll say I really like the jetpack troopers, like you say their pose is really natural (or something) and of course your dramatic white is well executed as usual. The flames were a good idea, though I'm surprised they weren't included on the sculpt. Odd. age has made me dim and decrepit. It's now a race to see how many minis I can pump out before the Grim Reaper finally claims me. I know that "not today, amigo" feeling very well. I also find with myself that I can't paint for more that 1.5 hours at a time. After that, the eyes and especially the brain need a rest. Do you find that too? Nah, the day I get 1.5 hours to do anything is a rare day indeed. But you're probably right, my eyes couldn't take it anyway. The stormtrooper painting is excellent! And the Jackie Treehorn reference has made this my favorite post! Any day when you can write (or read) a reference to the Big Lebowski is a good day. Return of the Matthew! 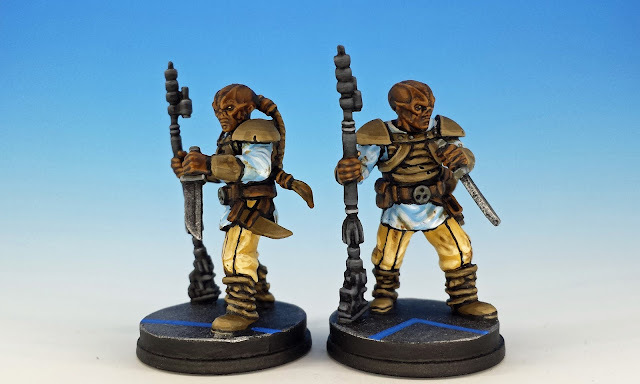 Fantastic brush work with these SW characters! Love them. I'm glad you noticed by absence, Michal! I was so busy trying to get these IA figures painted up that I ignored by blog for a while, notwithstanding the fact that I have a huge backlog of pictures to post... (hello Mansions of Madness). I love the vibrancy of your paint jobs, especially when working with "dull" natural tones you wouldn't expect to be able to achieve it. Thank you! I think it helps that I don't use washes too often. They are a wonderful tool (and one that I'm not very adept at) but if over-used, I think they tend to darken and dirty miniatures. Is the skiff included in the set ? No, the skiff is something I just kit-bashed together from an old Micro Machines model. I took some photos of how I put it together, and I'll post them in the day couple days. Oh, just wow. Where does the skiff come from? I love the flames, I'm just about to paint these guys myself! He treats objects like women, man! I can't wait to see what you do with them, Barks. I love your stuff. As I said to APJ above, my next post will be about the skiff. 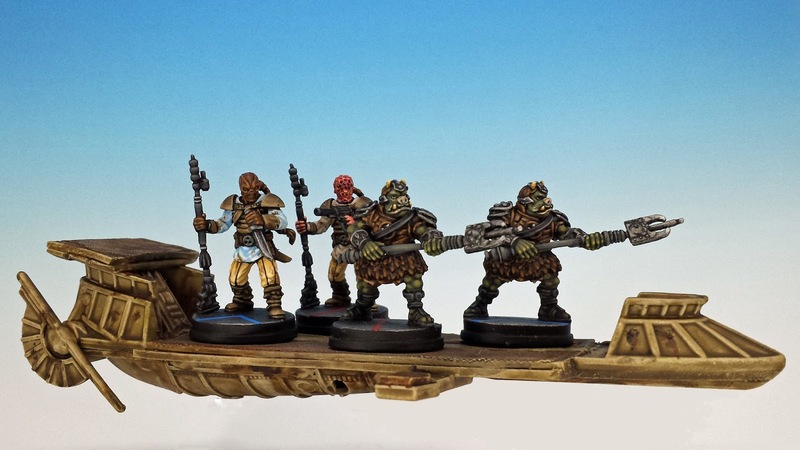 Really digging your extended Action Fleet skiff! Well done! Thanks Ted -- I think the skiff is my favourite part too. Those are looking great. Those glasses are really working! They've certainly made my painting more enjoyable. Delightful as always! May I ask, where is the skiff from? It's a heavily modified Micro Machines model. I took photos of how I converted it, and I'll post them in the day couple days. Oooh, I'm in love with these. The Force is indeed strong with you. Well, you're Imperial Assault work is a big inspiration for me. I love the subtle conversions you do with the models. These are terrific, Matthew! Great work! Thanks Mr. Mouse! I'm glad you stopped by. Those look great! I'm glad I know nothing about this game or is probably want to start thanks to you! 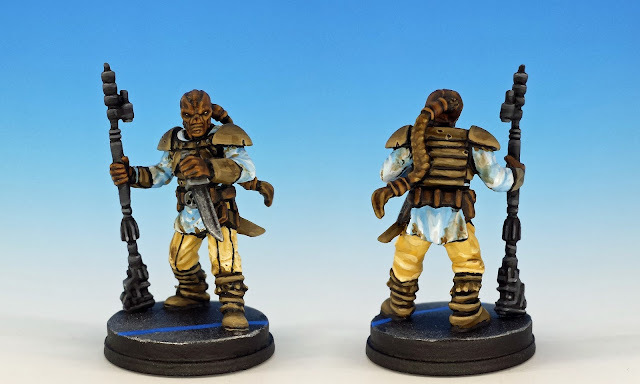 I wish you would get into it -- I love your personal painting style, so it would be fun to see what you do with these minis. These look great! I've had prescription readers for a couple of years now. At first I wore them all the time while on reading, painting and on the computer. I went from no eye problems to I can't see very well at any distance in short order, although I have worn glasses since I was ten. Now I mostly just take my glasses off and hold things close to my face. Ah, we are both decrepit! Laughed a sad laugh at the second paragraph. Awesome paint jobs. Enjoyed the commentary on the new and the old touches to classic icons. Thanks! And looking forward to meeting you in the flesh next week. Terrific job! I think these are your best minis to date. Thanks very much for that. I think I'm certainly getting better at painting Stormtroopers. I thought they would be so easy, being essentially monochromatic. But simple is always the hardest to master. Some more solid additions to your already impressive SW collection mate. Gamorreans were like Stormtroopers to me - look badarse, but are otherwise bloody useless in the films.